Kirk Bell September 24, 2018 Comment Now! The route south from Seattle to Yakima, Washington, winds through the Mount Rainier National Park. Streams and valleys bracket the road, the scenery changes from green to brown, and Mount Rainier stands majestically in the distance, snow-capped even in September. 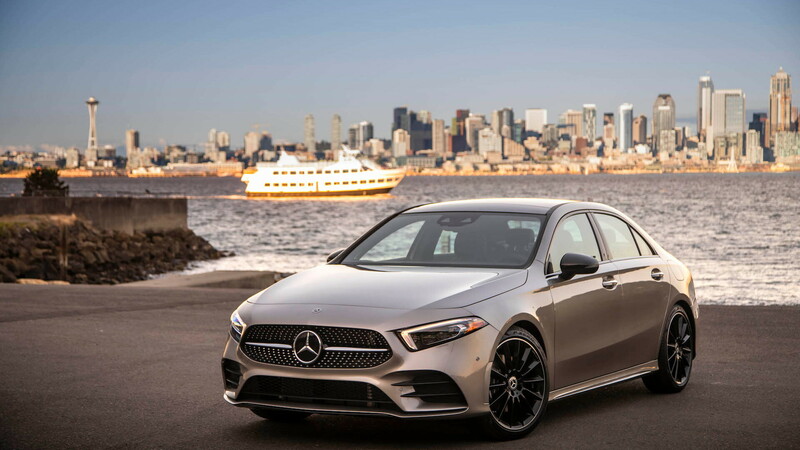 The 2019 Mercedes-Benz A-Class is a lovely car for this scenic drive and a step up in every way from the current “baby Benz,” the CLA-Class, except perhaps, in looks. The A-Class owes its combination of sporty dynamics and ride comfort to the mistakes of the CLA. “The CLA was flawed from the start,” a Mercedes chassis development engineer tells us. He’ll go nameless here because he probably wants to keep his job, but he further explains that Mercedes aimed for sportiness in the CLA at the expense of ride quality. The previous A-Class, which was offered as a hatchback and never sold in the U.S., was too stodgy, so Mercedes engineers erred in the opposite direction for the swoopier CLA. As a result, the CLA is fun to drive as long as the roads are glass smooth, but the ride becomes buckboard hard when the road turns rough. 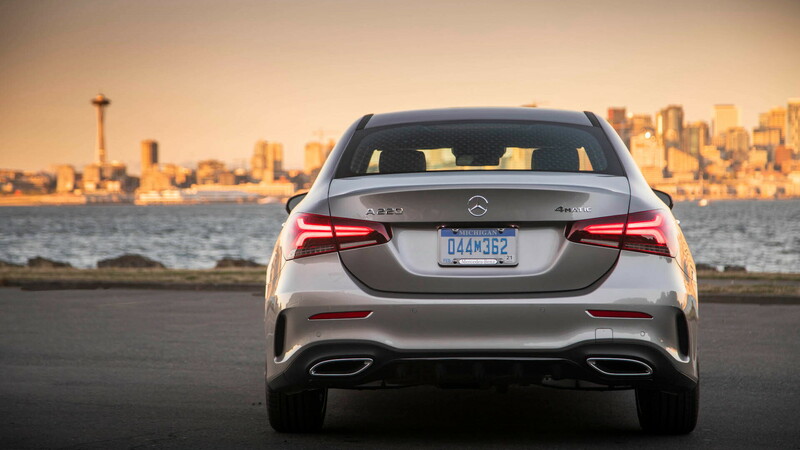 The 2019 Mercedes-Benz A-Class supplants the CLA as the brand’s entry-level car, though it is related to the CLA, which arrived with a price below $30,000 (before the mandatory destination charge) in 2013. The A-Class rides on the MFA 2 platform, the second generation of the Mercedes Front-drive Architecture adapted from the CLA’s underpinnings. It’s an evolution of the same platform, with a new central underbody and 30-percent stiffer mounting points for the chassis components. The latter allowed for softer spring and damper settings to retain the CLA’s sportiness and ease up on the kidney liquification. I take the wheel under a tunnel of trees just outside the entrance to Mount Rainier National Park. The steering immediately presents as weighty and direct with rock-steady on-center stability. I’m in a particularly attractive version of the A-Class that boasts optional 19-inch wheels and the AMG Line package, which adds AMG body styling, a chrome-finish diamond-block grille, perforated front brake discs, and a suspension that is lowered 0.6 inch. The A-Class offers 17- or 18-inch wheels as well, so this should be the stiffest riding model, but the ride feels more planted and supple than rigid. The road here undulates and the A-Class responds with some bounding, especially from the rear. That’s likely more due to the short 107.4-inch wheelbase than stiff suspension tuning. I leave the park and enter the Yakima Valley, where farms and apple orchards dot the open land. Here, the A-Class proves fun to toss into the occasional sharp corner. The steering is quick enough with its 14.4:1 ratio to turn in crisply, and the car suffers from little body lean. I find no esses here, but the short wheelbase and minimal lean should make the A-Class quite agile. I’m looking forward to the AMG A35 and A45 models that are likely to follow. Until then, I’ll make due with the mild 2.0-liter turbo-4 under the hood of the two launch models: the front-wheel-drive A220 and the all-wheel-drive A220 4Matic. This engine musters 188 horsepower and 221 pound-feet of torque, and sends it through a 7-speed dual-clutch transmission. While those numbers are down by 20 and 37, respectively, from the 2.0-liter turbo-4 in the CLA250, this spirited engine launches the car from 0-60 mph in an estimated 7.0 seconds, and has plenty in reserve for highway passing. 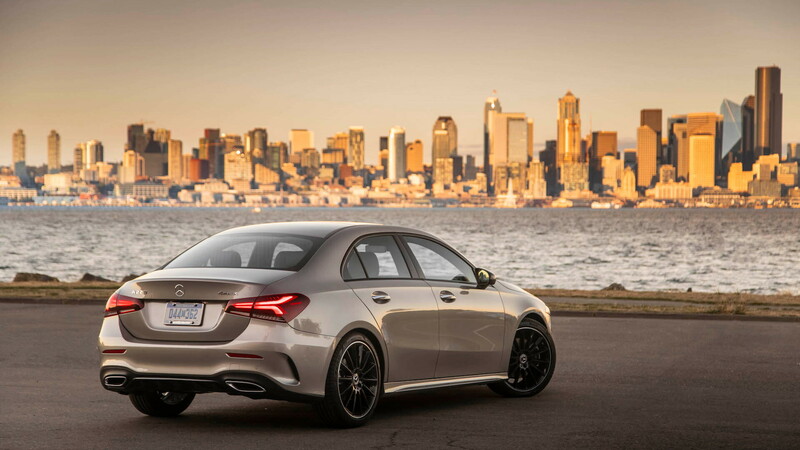 The 7-speed shifts responsively, and between the engine and transmission, the A-Class doesn’t suffer the occasional pause in power delivery that you can experience in the CLA250. With the launch of the A-Class, Mercedes is also introducing its MBUX infotainment system. It features two dashboard screens set next to each other under a single pane of glass. Mercedes makes 7.0-inch screens standard, and offers 10.25-inch screens as an option. With either setup, the right screen is a touchscreen—a first for Mercedes. 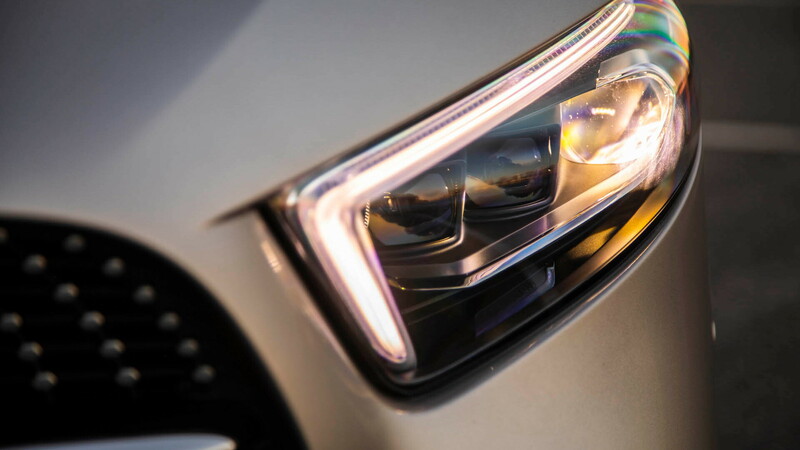 Powered by the latest graphics chip, MBUX uses artificial intelligence to learn the preferences and patterns of the driver, and uses both onboard and cloud-connected data to respond to commands and requests. My first experience with the system is generally positive, and even when it’s negative it’s positive. More on that in a bit. In addition to that touchscreen, MBUX can be controlled through steering wheel controls like other current Mercedes systems, via an enlarged trackpad with haptic feedback (the rotary dial is gone), or by natural speech recognition. The driver doesn’t have to learn what specific commands MBUX will accept. It recognizes any of the hundreds of ways someone might say something like “navigate to work.” Voice commands are prompted by a button on the steering wheel or simply by saying, “Hey Mercedes.” I find, however, that it lurks in the background like an overly helpful version of HAL and wants to chime in when anyone in the car says the word “Mercedes.” That can happen fairly often…in a Mercedes. Mercedes says to think of MBUX like Siri or Alexa on wheels. I throw some questions at it: “Who starred in ‘The Help’?” and “How far to Mount Rainier?” It doesn’t recognize what I’m asking for either question. Either that internet connection is bad here or the intelligence behind it isn’t as smart as Siri. One surprise-and-delight feature is the augmented reality feature on the navigation screen. On the route Mercedes has programmed, a forward-looking camera shows a view of intersections where we’re supposed to turn. Over top of that, it adds navigation arrows, the names of streets, and the occasional street address, all which proves especially helpful when the streets aren’t marked. The MBUX screen swipes quickly left and right to move through XM radio stations, the system will pair a phone via Bluetooth on the move, and it is fairly intuitive to find various functions. See? Even when it’s frustrating, MBUX is entertaining. MBUX will show up next on the Sprinter van and GLE crossover, and it will surely spread throughout the lineup. New technology usually trickles down into lower-line models, but here it will trickle up. Wouldn’t it be great if the economy worked like that? One of the biggest knocks against the CLA is its poor backseat. Short on leg room and horribly tight on head room, it’s best left to Igor the hunchback. The A-Class has a traditional sedan shape instead of the sharply angled coupe-like roof of the CLA, so rear head room is not an issue. Especially low rear seat cushions contribute to the plentiful head room, but they utterly lack rear thigh support, so adults will only be comfortable back here for short trips before leg fatigue set sin. As for knee room, my 5-foot-9 frame fit behind a 6-foot-1 driver without an issue. Anyone taller front or rear would make that rear seat space awfully tight, though. Those low rear seat cushions let the seatbacks fold almost completely flat to make the fairly spacious trunk (Mercedes doesn’t have a measurement yet, but I’d estimate at least 14 cubic feet) all that more useful. Up front, the seats have good room for two and are fairly comfortable. These aren’t sport buckets, though, and the Audi A3—and especially the S3—both offer more supportive thrones. A quick run through the options list shows our test car has just over $14,000 in options, but that doesn’t include leather upholstery. Instead, it has a two-tone MBTex synthetic leather that looks decent and may be more durable than leather, but isn’t as supple. Same goes for most of the surfaces of the interior. Mercedes covers the dash and door panels with soft-touch vinyl, but it’s glossier and not nearly as rich as what you get in the brand’s higher-end vehicles. The turbine-look air vents, on the other hand, are among the best-looking interior features in any car on the market. Mercedes also offers 64 colors of ambient lighting as an option. 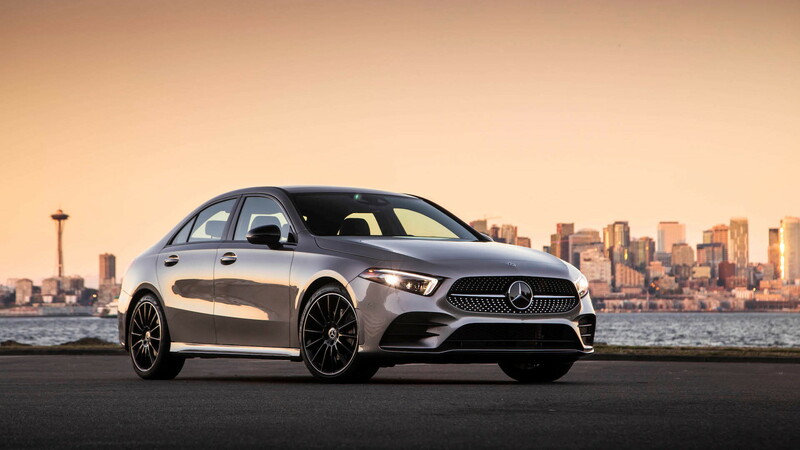 The 2019 Mercedes-Benz A-Class drives better than the CLA, offers more space, and Mercedes will outfit it with more standard equipment when it comes to the States early next year. Among those features will be a panoramic sunroof, LED headlights and taillights, MBUX with the 7.0-inch dashboard screens, dual-zone automatic climate control, a power driver’s seat, and the MBTex upholstery. Pricing hasn’t been announced, but the A-Class will also be priced in below the CLA, which starts at about $34,000. Watch for the CLA to move upmarket, a la the CLS in relation to the E-Class, and get a redesign based on the A-Class’s updated underpinnings later next year. For now, it’s a given that the A-Class is a better car than the CLA. But the new baby Benz also stakes a claim as the best entry luxury sedan on the market and rises above rivals like the Acura ILX and Audi A3, both of which are aging, in dynamics and certainly in technology. Mercedes-Benz provided travel and lodging to Internet Brands Automotive to bring you this firsthand report.